Scopa is an Italian card game, and one of the two major national card games in Italy. It is also popular in Brazil, brought in by Italian immigrants, mostly in the Scopa di Quindici variation. Scopa is also played in countries like Libya and Somalia. It is played with a standard Italian 40-card deck, mostly between two players or four in two partnerships, but it can also be played by 3, 5, or 6 players. The name is an Italian noun meaning "broom", since taking a scopa means "to sweep" all the cards from the table. Watching a game of scopa can be a highly entertaining activity, since games traditionally involve lively, colorful, and somewhat strong-worded banter in between hands. However, skill and chance are more important to the outcome of the game. A deck of Italian cards consist of 40 cards, divided into four suits. 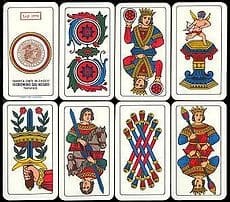 Neapolitan, Piacentine, Triestine, and Sicilian cards are divided into Coppe (Cups), Ori or Denari (Golds or Coins), Spade (Swords) and Bastoni (Clubs), while Piemontesi, Milanesi and Toscane cards use the 'French' suits, that is Cuori (Hearts), Quadri (Diamonds, literally "Squares"), Fiori (Flowers) and Picche (Spades, literally "Pikes"). The values on the cards range numerically from one through seven, plus three face cards in each suit: Knave [Fante in Italian] (worth a value of 8), Knight [Cavallo in Italian] in the Neapolitan-type decks or Queen [Donna in Italian] in the Milanese-type decks (worth 9), and King [Re in Italian] (worth 10). A Knave is a lone male figure standing. The Knight is a male figure riding a horse; the Queen is a female figure. The King is a male figure wearing a crown. To determine the face value of any numeric card, simply count the number of suit icons on the card. Since the Coins are important in winning some points, the cards of that suit are also nicknamed as "bello" (handsome): so, "il settebello" is the Seven of Coins, "l'asso bello" is the Ace of Coins/Diamonds. The player to the dealer's right begins play. This player has two options: Either place a card on the table, or play a card to capture one or more cards. A capture is made by matching a card in the player's hand to a card of the same value on the table, or if that is not possible, by matching a card in the player's hand to the sum of the values of two or more cards on the table. In both cases, both the card from the player's hand and the captured card(s) are removed and placed face down in a pile in front of the player. These cards are now out of play until scores are calculated at the end of the round. If by capturing, all cards were removed from the table, then this is called a scopa, and an additional point is awarded at the end of the round. Opponent is capturing two cards with one card from his hand (1+3=4). Capture the 6 of swords and ace of coins using the 7 of clubs, and place all three cards face down in front of him. Note that it is not legal to place on the table a card that has the ability to capture. For example, if a 2 and a 4 are on the table and a player holds a 6, the player must either take that trick or play a different card from his hand. In any circumstance in which a played card may capture either a single or multiple cards, the player is forced to capture only the single card. For example, if the cards on the table are 1, 3, 4, and 8 (Knave, or Fante in Italian), and the player plays another Knave, the player is not allowed to capture the 1, 3, and 4, even though their total does add up to 8. Instead, the player is only allowed to capture the Knave. After the dealer has played the final card of the final hand of the round, the player who most recently captured is awarded any remaining cards on the table, and points are calculated for each player or team. If no team has yet won the game, the deal moves to the right. The new dealer shuffles and deals the cards as described above. Likewise, if a player is holding a six and there are an ace, a two a three and one four on the table, he should chose the five plus the ace, unless of course he has already taken the seven or the six of the suit of the ace and unless one of the two remaining cards is of the coins suit and he hasn't made the point of coins yet. It is also possible to agree on a different score, usually with increments of five or ten, e.g., 16, 21 or 31 points. Traditionally, one card from a sweep is turned face up in the captured cards, to remind players while calculating points that a scopa was won, and to taunt them. Many players deal the initial table cards in a 2x2 square. There are many variations of scopa. Since there are no formal rules, it is good manners to agree with the other players on the rules that are to be used before starting a game. Many of the variations here can be combined. For example, a common variant in the Milan area combines "Scopone scientifico", "Scopa d'Assi" and "Napola". When playing with a standard 52-card pack with French suits, 12 cards need to be removed from the deck. Easiest for most new players is to remove the face cards, and therefore play with cards ranging numerically from one through ten. More traditional is to remove the eights, nines, and tens from the deck, which yields the 40-card "Milanese" deck. With the Milanese deck the Jack is 8, the Queen is 9, and the King is 10 (note that in some Neapolitan decks, the Jack is called Queen and is worth 8). Regardless of which cards are removed, the diamonds suit are used for the Italian coin suit, making capturing the most diamonds and the seven of diamonds each worth a point. In this variation of the game, playing an Ace captures all cards currently on the table (and does not count as a scopa). Depending on other chosen variants, it can happen that an ace is already on the table when one draws an ace. Rules vary as to whether or not the player will take all the cards, but usually the player who only take the ace that is there. This event, that every player will try to avoid, is called burning an ace. The game of Scopone is based on Scopa. 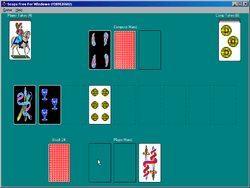 In this game, which must be played in 2 teams of 2, players are dealt all nine of their cards at the start of each round. Play proceeds around the table until all players have played all of their cards. In another form of the game, the scopone scientifico, the players are dealt ten cards each so that none is left. 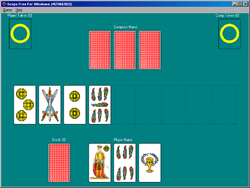 Scopa d'Assi is mostly played in the latter variant. In this variation (also known as Scopone trentino), a team capturing the ace, two, and three of coins achieves the Napola (or Napoli) and is awarded additional points equal to the highest consecutive coin they obtain, e.g. if a team captures the ace, two, three, four, and five, and eight of coins, that team is awarded 5 additional points. Because of the higher amount of points awarded per game, the game is played until one team has 21 points, rather than 11. Sometimes a team that manages to capture all 10 coins in a single round wins the game immediately. In the Re Bello ("Beautiful King") version, the King of coins also counts as a point, just as does the Seven of coins. In some regions of Calabria (especially near Cosenza), a point is awarded for the seven of cups in addition to the seven of coins. In this variation, the played card does not take a card or set of cards that sum to the value of the card played. Rather, it takes any set of cards including itself that add to 15. If the table is A, 3, 5, 7, playing a 2 would take itself plus the A, 5 and 7 (A + 2 + 5 + 7 = 15). This Genoese variation is highly popular in Liguria and bordering zones; it is basically a mixture of traditional scopa, "Scopa di quindici" and "Scopa d'assi", plus it awards additional points for the "Grande" (Big One - 5 points go to the player able to take all three figure cards of coins), "Piccola" (Small Ones - 1 point awarded for each consecutive card of coins after the ace, note that's entirely possible for a player to get the "most coins" point but neither the Big One nor Small One bonus due to the opponent securing vital cards in the sequence). Moreover, Cirulla players whose hand of three cards adds up to less than 7 (9 in some regions) have to put all of them down on the table and mark three points as if he scored that many "scopa". To the end of such calculations the seven of cups (hearts in Milanese-types) counts as "matta" ("joker"): the player decides its value. With such a high degree of point-awarding combinations and the possibility of scoring dozens of points in a single hand Cirulla games are tense affairs, where seemingly desperate situations can be reversed in a matter of minutes and where the ultimate goal can be set at hundreds of points, up to 1001 in some cases. 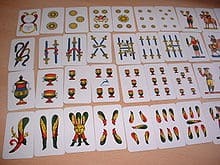 Scopa is very popular in Libya and is usually played as mentioned above But some local variations were added like for example a) a sweep of Diamonds (sometimes nine are enough) will reset the opponent to zero b) count Scopas based on the value of the winning card c) count Scopa value based on the total number of cards involved. A number of variant point systems are used for calculating the prime, most of which produce the same order of hands. One notable variant that does not produce the same order is to count 0 points for each face card. Some play to 16 or 21 points, or even to an arbitrary score agreed to at the beginning of the game. There is a playable version of Scopa within the Nancy Drew game The Phantom of Venice.